From Left: Oliver Schulze, great grandson of Colonel Boyce Thompson; Anthony Viceroy, CEO, WESTMED Medical Group; Westchester County Executive Robert P. Astorino; Joe Simone, President, Simone Development Companies; City of Yonkers Mayor Mike Spano; Dr. Steven Meixler, WESTMED; Dr. Laura Philips, Chair, Board of Directors, Boyce Thompson Institute; Donna McGregor, Executive VP and COO, St. John’s Riverside Hospital; Dr. Richard Morel, WESTMED; Guy Leibler, President, Simone Healthcare Development. YONKERS, NY (May 24, 2017) — For nearly four decades, the Boyce Thompson Institute plant research center building in Yonkers sat abandoned and deteriorating, its walls covered in graffiti, greenhouses in ruins and grounds overgrown. Yesterday, executives of Simone Development Companies joined with Yonkers Mayor Mike Spano and City and County officials to celebrate the remarkable transformation of this historic building into the Boyce Thompson Center, an innovative 85,000-square-foot mixed-use center featuring premier office/medical space, retail stores, restaurants and banking. 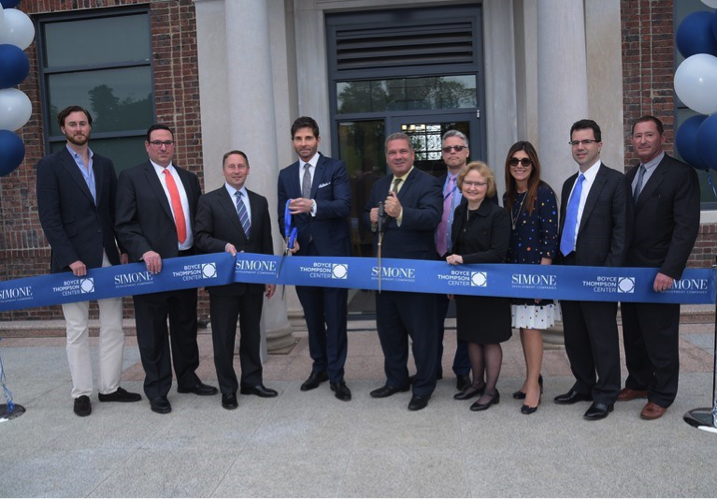 “The grand opening celebration represented an important milestone for Simone Development and the City of Yonkers. What was once an eyesore will now be generating tax revenue for the City, creating jobs and bringing new retail and healthcare services to the residents of Yonkers and nearby Rivertown communities. We are especially pleased to be preserving an important piece of history for Yonkers and Westchester County,” said Joseph Simone, President of Simone Development Companies, the developer of the $35 million project. Built in the 1920s, the property was acquired by Simone Development two years ago which meticulously restored the main building to its original character with a glorious new plaza and fountain. On the northern end of the site, a new two-level, 15,000-square-foot freestanding building was constructed and is leased to St. John’s Riverside Hospital for outpatient care and physician offices. Services will include internal medicine, family medicine, cardiology, orthopedics, pulmonology, neuro spinal, nephrology, GI, general surgery, pain management and continuity clinic. A new 20,000-square-foot addition was constructed at the southern end of the main building with an architectural style resembling the historic building. WESTMED Medical Group is leasing the entire structure. In addition to the services of OB/GYNs, perinatology and family medicine, WESTMED will offer on-site diagnostic imaging, perinatology and Urgent Care—all under one roof. Imaging services will include 2D/3D mammography, X-rays for adults and pediatrics and ultrasound for high-risk Maternal Fetal Medicine and breast imaging needs. In addition to St. John’s and WESTMED, other healthcare tenants include Westchester Gastroenterology, Juvanni Med Spa and Family Wellness Pharmacy. Retail tenants include Tompkins Mahopac Bank, PLUSHBLOW Salon, Ultimate Spectacle and The Taco Project. Fortina, one of the region’s hottest restaurants, has leased the entire wing on the northern end of the main building. Led by celebrity chef Christian Petroni, Fortina is scheduled to open next month. Guy Leibler, President of Simone Healthcare Development, said the adaptive repurposing of the Boyce Thompson Center provided the company with a unique development opportunity. “Not only are we restoring an important historic building, we are also creating a mixed-use development that incorporates state-of-the-art medical space with retail, restaurants and other services,” he said. “As healthcare becomes more consumer-driven, facilities such as the Boyce Thompson Center will become more attractive to medical practices and ambulatory care facilities that want to be located in an environment that offers patients and employees easy access to retail stores, restaurants and free parking,” he added. In addition to preserving the classic architectural style of the main building, Simone Development is also honoring the building’s legacy as a plant research center. This week Simone is hosting a reception at the center for officials from the Boyce Thompson Institute which is now located in Ithaca, NY. Vintage photos of the institute in the 1920s are on permanent display in the main building. Simone Development recently commissioned internationally-known Dutch street artist Eelco van den Berg to design and paint a dynamic mural for the southeast lower wall of the main building. The graffiti-inspired public art design – which covers a 53 by 15-foot wall area – was a collaborative effort of the artist, the Boyce Thompson Institute and Simone’s Boyce Thompson Center design team. The bold and colorful design features a combination of images depicting plant life, insects, birds and scientific research. Approximately 85 percent of the Boyce Thompson Center is leased and additional new tenants will be announced soon. The unprecedented success of the Boyce Thompson Center is yet another example of the economic renaissance in Yonkers which has more than $1 billion in development under way. Standing with street artist Eelco van den Berg who is holding a drawing of the new mural are, from left, Brian Sisco of 115 Studios; Christopher St. Lawrence, Assistant Director, Yonkers Department of Planning Development; Wilson Kimball, Commissioner, Yonkers Department of Planning Development; Guy Leibler, President, Simone Healthcare Development; Cynthia Williams, Project Director, Simone Development Companies; and project architect Ron Hoina of Design Development Architects. YONKERS, N.Y. (April 2017) – The Boyce Thompson Center, an innovative mixed-use center nearing completion in Yonkers, recently unveiled a vibrantly colored mural that honors the building’s rich horticultural research history. Simone Development Companies, the developer of the Boyce Thompson Center, commissioned internationally-known Dutch street artist Eelco van den Berg to design and paint a dynamic mural for the southeast lower wall of the main building. 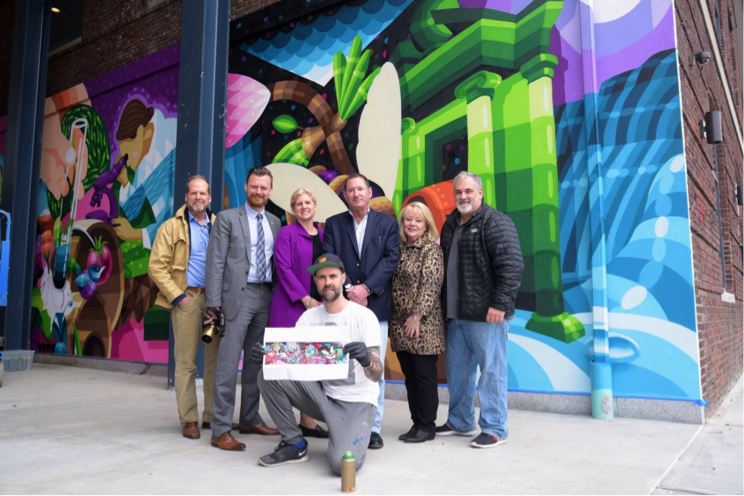 The graffiti-inspired public art design – which covers a 53-foot by 15-foot wall area – was created through a collaborative effort of the artist, the Boyce Thompson Institute of Ithaca, NY and Simone’s Boyce Thompson Center design team. The bold and colorful design features a combination of images depicting plant life, insects, birds and scientific research. “We truly are honored to have such a renowned artist create this exciting new mural that vividly captures the rich history of this important Yonkers landmark building,” said Guy Leibler, President of Simone Healthcare Development. Van den Berg’s murals have graced walls in the Netherlands, Belgium, Germany and in several U.S. cities including Brooklyn and most recently Chicago. This is his second mural in Yonkers. Last year he completed a mural at 41 N. Broadway above the new daylighted portion of the Saw Mill River at Mill Street. Built in the 1920s, the main building at the Boyce Thompson Center once served as the home of the Boyce Thompson Institute, a renowned horticultural research center. After the institute became affiliated with Cornell University and moved to Ithaca in the mid-1970s, the building sat abandoned and deteriorating, its walls covered in graffiti, greenhouses in ruins and grounds overgrown. In 2015, Simone Development Companies, a leading developer of commercial and retail space in the tri-state region, acquired the six-acre site located at North Broadway and Executive Boulevard. The historic main building has been meticulously restored to its original character and transformed into an 85,000-square-foot mixed-use center featuring premier office/medical space, retail stores, restaurants and banking. A new 20,000-square-foot addition has been constructed at the south side of the main building with an architectural style resembling the historic building. WESTMED Medical Group is leasing the entire new structure. On the northern end of the site, a new two-level, freestanding building has been constructed at the corner of Executive Boulevard and Executive Plaza and is leased to St. John’s Riverside Hospital. The $35 million Boyce Thompson Center project began construction in 2015 and is scheduled to open next month. Approximately 80 percent of the center has been leased to a wide range of medical and retail tenants that includes Fortina Restaurant, Starbucks, Tompkins Mahopac Bank, Westchester Gastroenterology, Juvanni Med Spa, Family Wellness Pharmacy, PLUSHBLOW Salon, Ultimate Spectacle and The Taco Project. Simone Development Companies is a full-service real estate investment company specializing in the acquisition and development of office, retail, industrial and residential properties in the New York tristate area. Headquartered in the Bronx, the privately held company owns and manages more than 5 million square feet of property in the Bronx, Westchester County, Queens, Long Island and Connecticut. The company’s portfolio includes more than 100 properties and ranges from multi-building office parks to retail and industrial space. The company’s largest and most successful development is the 42-acre Hutchinson Metro Center office complex located directly off the Hutchinson River Parkway in the Pelham Bay section of the Bronx. The first two phases of the complex, which comprise nearly 750,000 square feet of Class A office and medical space, are fully leased. Two additional phases totaling 650,000 square feet (370,000-square-foot Metro Center Atrium and 280,000-square-foot Tower Two), are completed and fully leased.